How are we to understand the changing role of design and designers in the new age of consumer experience? 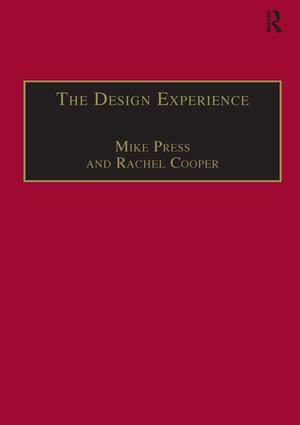 Drawing on perspectives from cultural studies, design management, marketing, new product development and communications theory, The Design Experience explores the contexts, practices and roles of designers in today's world, providing an accessible introduction to the key issues reshaping design. The book begins by analysing how consumers acquire meaning and identity from product and other experiences made possible by design. It then explores issues of competitiveness, innovation and management in the context of industry and commerce. If designers are creators of human experiences, what does this mean for their future role in culture and commerce? Subsequent chapters look at new ways in which designers conduct user research and how designers should communicate about design and decision-making with key stakeholders. The authors conclude with a discussion of the design 'profession': will that label be a help or hindrance for tomorrow's designer? Written for students of design, design management, cultural and business studies, The Design Experience is also of interest to practitioners of design, marketing and management. Illustrated case study material is integrated into the text, and the book also includes a glossary, and extensive references. Contents: Introduction; Design and consumer culture; Design in industry and commerce; Designing the experience; Research for design; Communicating design; The design professions; Glossary; Index. Mike Press is Professor of Design Research and Head of the Art and Design Research Centre at Sheffield Hallam University. He has written widely in the fields of design, the applied arts and design management, has addressed conferences worldwide and has broadcast on television and radio. Rachel Cooper is Professor of Design Management at the University of Salford where she is Director of the Adelphi Institute for Research into Creative Arts and Sciences. Author of many books and papers in the field of design research, she is also the founder of both the European Academy of Design and the Design Journal of which she is the Editorial Chair. The authors collaborated previously in writing The Design Agenda: a guide to successful design management which is published in both English and Chinese. They have co-directed projects for the Design Council, and have established the Design Policy Partnership as a think tank and research consultancy advancing socially responsible design.